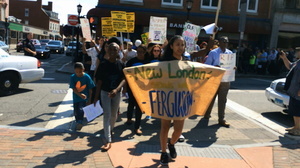 People from across Connecticut have come out to many rallies, vigils and marches in support of the rebellion in Ferguson, Mo., following the police killing of Michael Brown. 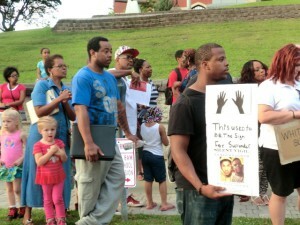 About 70 people, including 15 children, took part in a vigil for Michael Brown in front of Kingston, N.Y., City Hall Aug. 14. 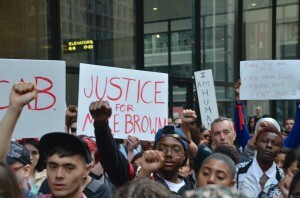 Chicago took to the streets, in solidarity with over 50 cities, demanding justice for Michael Brown and an end to police brutality. Hundreds gathered for a national moment of silence for Michael Brown that lasted four minutes; one minute for every hour that cops left Michael’s body in the street after shooting him. 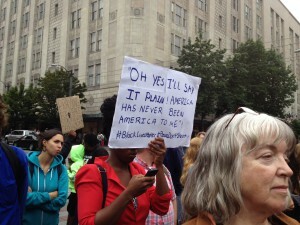 A speaker said, “…Black lives matter, children’s lives matter and Palestinian’s lives matter…” Solidarity was not only the point of today’s action, but also the feeling that was shared among the attendees. 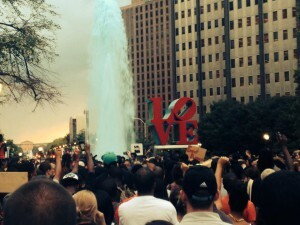 On August 14, as part of the National Moment of Silence actions coordinated in solidarity against the racist police killing of Michael Brown and with the resistance of the people of Ferguson, independent members of the community organized a vigil at Love Park in center city Philadelphia. On Sunday, August 17, over 800 people rallied and marched in downtown Los Angeles against racist police killings from LA to Ferguson, Missouri. The rally began at the Los Angeles Police headquarters and marched through several crowded areas bringing a message of resistance and struggle. Many many onlookers expressed solidarity with the march. The police murder of Ezell Ford, a 24-year-old mentally disabled African-American youth, was the spark that lit the anger seething across LA. Communities are fed up with racism, police brutality, unemployment, poverty, cut backs in city services – all amid vast wealth for a few. Ezell was shot in the back by two officers while he was laying on the ground.